I have written on occasion about Big Government (or any other Andrew Breitbart website), as well as the people who comment on those websites and their propensity to lie and "flame" opposing viewpoints. Over the past several months, I have observed that the commenters at the right-wing propaganda sites have become more aggressive in their tactics, posting personal information on the message boards and threatening others who point out their lies. 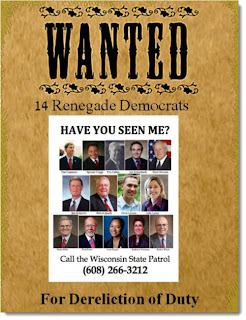 Thursday was no different - in an article by the Big Government editorial board regarding the absentee Democratic state legislators of Wisconsin, featuring a graphic of a old-west "dead-or-alive" style wanted poster, I had caught commenters attacking someone with a negative IntenseDebate score with a handful of lies. I decided to weigh in. 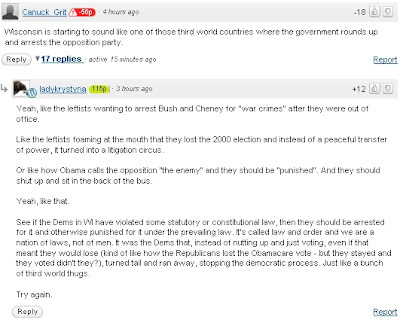 Did my comment warrant the ambiguous and threatening response of "You're goin down" from anonymous commenter kooz? The reason why I pointed out the hypocrisy of ladykrystyna's response to Canuck Grit is because ladykrystyna believed they were pointing out a lie, but they used a misconception (propagated by the right) to discredit Canuck Grit - Obama never told Republicans to sit in the "back of the bus." 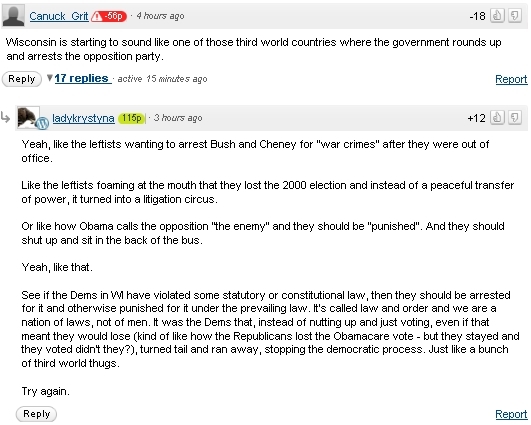 If ladykrsytna couldn't get one fact right, what makes you think they could get the rest of their comment right, like the comparison to calls from some wanting to charge top administration officials with "war crimes" after they were out of office, which is different then comparing them to dictatorial regimes that arrest opposition leaders (similar to using state patrolmen to arrest legislators for refusing to show up for a vote), or Republicans losing a vote against health care reform - ladykrystyna insists the GOP "nutted up" and voted despite losing, when instead of taking it like a man, the GOP have resorted to trying every trick up their sleave to stop the law dead in its tracks, whether trying to strip necessary agencies of their funding, challenging the law in the courts, or refusing to implement parts of the law at state level. Besides, the healthcare bill was one big compromise. Democrats walked back plenty of their initial plans to accomodate obstructionist Republicans, only to be opposed by Republicans in the end. That is much different then not showing up to debate with a governor and a Republican-led legislation that refuses to negotiate on anything, despite the fact that unions and Democrats are willing to make some concessions. Because I asked a simple question with a simple answer - Obama never said sit in the back of the bus - the ignorant masses at Big Government decided to push back against the truth and attack the messenger, which in this instance was me, but instead of calling me a "troll" or making the obligatory gay comment, which commenters at Breitbart's sites frequently do, I was told that I was "goin down." Wow. I followed the link and read the comment thread. 1) They love to give each other worthless kudos with words like "bitchslapped"; 2) Not one rebuttal addressed your points directly, nor with any facts; 3) The level of discourse when someone disagrees is playground immature; 4) I only lasted 5 minutes reading through them; 6) Did that guy really call you "Skippy"? I have to force myself to go over there. It is always interesting to go into the lion's den, because if you don't you will never know their thought processes. I never insult (except for that one time I experimented in seeing who's comment would get deleted first - mine or theirs) and I try real hard to understand their position and offer an opposing view that would prove them wrong. Here is one of my favorites - the people at Big argued against using schools/union halls as polling places - I asked if the same standards should apply to churches. The author actually responded in the comment thread trying to defend his piece. IT was great. California State Assemblyman has also visited this website and offered some spirited debate, but he seemed to lose interest when I wouldn't back down, but his comments did make me research the matter further to have a better understanding.